Illinois is planning $5.75 billion in borrowing, with more than half related to pensions. While the state’s current budget claims $400 million in savings from one of the pension moves, Illinois cannot make the same claim to the investors who might lend it the money. More debt is the wrong answer to the state’s pension crisis. On March 26 the state sold $452 million in general obligation bonds, $300 million of which will be used to fund “accelerated pension payments,” an incentive for some pension beneficiaries to accept a lump-sum payment in return for reduced benefits or removal from the pension system entirely. The justification for this program was that it would save the state money, with savings estimated at over $400 million in Illinois’ fiscal year 2019 budget. However, the Official Statement for the current borrowing tells potential investors that the state cannot quantify the amount or the timing of any reduction in the state’s pension liabilities resulting from the accelerated payment program. If that $400 million in savings fails to materialize, Illinois taxpayers get to make it up. That’s bad news because each Illinois taxpayer’s share of the state’s over $200 billion of debt is already $50,800, according to a 2018 report by Truth in Accounting. That’s a higher per-taxpayer state debt burden than in all but two states. Legislation that became effective in June 2018 established the Accelerated Pension Benefit Payment Program, which is intended to save money for the state and its underfunded pension systems by offering early pension buyouts. The early buyout program makes two offers to participants in the Teachers’ Retirement System, or TRS, the State Employees’ Retirement System, or SERS, and the State Universities Retirement System, or SURS. The first is directed at Tier 1 and Tier 2 beneficiaries of TRS, SERS and SURS who are no longer employed by the state but are vested in a state pension plan. They would receive a lump sum equal to 60 percent of the present value of their vested pension benefit after which they would be permanently removed from the system and receive no further benefits. The second offer is available only to Tier 1 members of TRS, SERS and SURS who are still employed by the state. They would receive a lump sum upon retirement in exchange for accepting a lower automatic annual increase, or AAI, of their pension benefits. Currently, state retirees receive a 3 percent compounded AAI. Those who opt for the lump-sum payment would receive only a 1.5 percent non-compounded AAI after they retire. To determine what the lump sum would be, the state would calculate the value of what the retiree has given up by accepting a lower AAI and pay the retiree 70 percent of that amount. SERS began offering accelerated pension benefits under the AAI reduction program in December 2018. As of March 1, 2019, 294 out of 1,318 applicants for retirement, or 22.3 percent, have picked the accelerated payment. The average payout is $96,400, in return for which retirees will receive 1.5 percent simple annual increases instead of 3 percent compounding increases. SERS plans to offer early buyouts during April and by June 30, 2019, TRS and SURS will also begin offering both options. The early buyout programs are available until June 30, 2021. However, Gov. J.B. Pritzker has proposed making the programs permanent. Doing so would eliminate the incentive for retirees to take the buyouts in the short term, which would reduce the $125 million in anticipated savings that are included in the fiscal year 2020 state budget. And at least one state lawmaker has noted that making the programs permanent would mean the state constitution’s pensions clause would make any future changes to the buyout program impossible. The state knew when the pension buyout legislation passed that it did not have sufficient funds to make the payments and would need to borrow the money. Now that pensioners are accepting the offer, the state is borrowing the money to make the lump-sum payments, adding to the state’s already high debt burden. 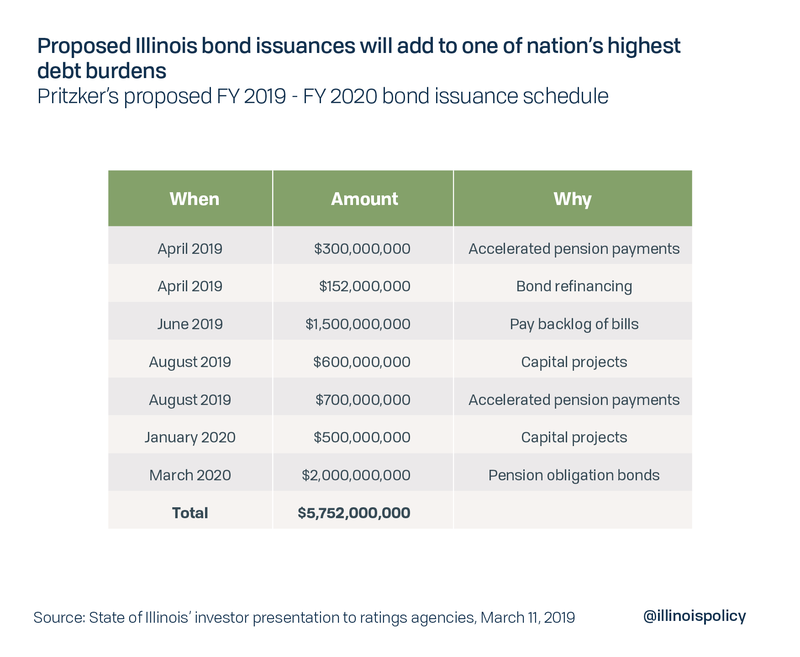 According to Pritzker’s presentation to rating agencies prior to the bond sale, Illinois will borrow another $700 million in August 2019 for early pension buyouts. Pritzker’s presentation was largely a pitch of his proposed progressive income tax and how it will supposedly stabilize the state’s finances, but it included plans to borrow an additional $4.6 billion over the next year – $1.5 billion in June 2019 to pay down some of the state’s unpaid bill backlog, $600 million and $500 million for capital projects in June 2019 and January 2020, respectively, and $2 billion of pension obligation bonds in March 2020. Borrowing is not the solution to Illinois’ fiscal woes, and its taxpayers, who bear one of the highest tax burdens of any state in the nation, cannot afford any more debt. The Illinois Policy Institute’s Budget Solutions 2020 offers a five-year plan to balance the state’s budget, pay off its debt and cut taxes. Among the proposed solutions is a constitutional amendment that would protect pension benefits already earned but allow changes to how future benefits accrue and stop the growth in the state’s pension debt once and for all.